UHS has undertaken extensive studies to find appropriate dorm, apartment, and hybrid style units that maximize efficiency while minimizing square foot requirements. These units are designed to integrate with one another, so that combinations between the different units can ‘fit’ within the same building. Moreover, these units are designed to keep cost down while still providing ample space for student experience through social interaction and study space. Shown here are six different unit types: apartment and hybrid style. These units vary from single occupancy studios to four-bedroom stand-alone apartments. Each unit is ADA accessible. An adaptation of the single-bedroom apartment, this studio apartment features a large living / sleeping space. Through a serious of studies, we determined the most optimized layout for a single occupancy room is the studio style apartment. By eliminating a wall that separates the living space from the bedroom the apartment opens up, making the space feel more inviting. This two-bedroom single occupancy is one of the most traditional and widely accepted two-bedroom units. The double occupancy equivalent of the standard two-bedroom apartment features twice the occupancy load with only a 1/2 increase in size. The largest apartment deployed, this four-bedroom apartment suite features generous living, kitchen, and bedroom spaces. 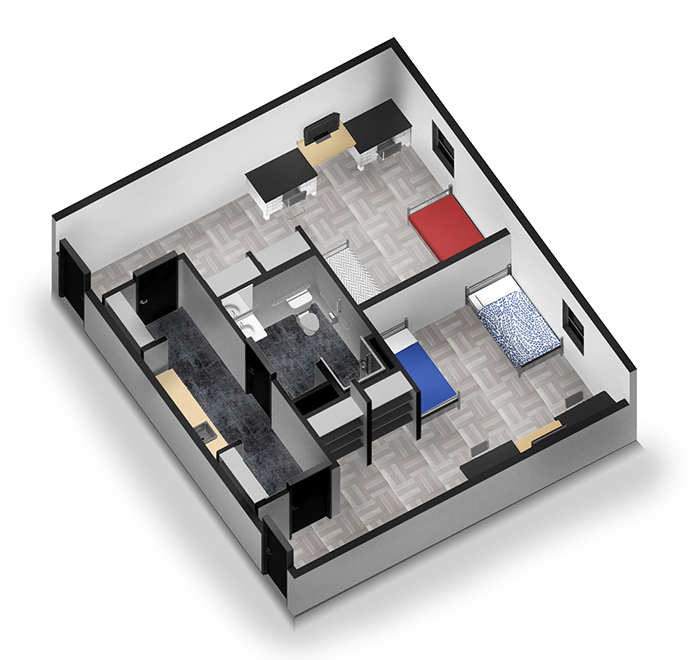 Taking the organization of our dorm-style layout and our apartment-style layout, the Hybrid-Style unit is arranged to bring privacy with two separate bedrooms while providing a shared communal kitchenette and restroom. This dormitory wing contains single and eight double living quarters organized about a central core containing four restrooms, a mechanical room, and a kitchen. Each large block is roughly 3,000 square feet and contains sixteen beds, making it one of the more efficient organization.